During the month of May, DOVE Hawke’s Bay was nominated for take part in “Good in the Hood” promotion at Z Kennedy Road. 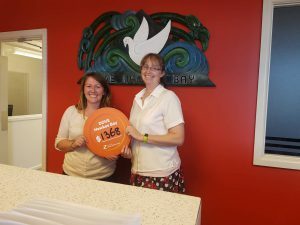 We had three of our staff members go down to Z Kennedy Road one lunch time to inform people what DOVE Hawke’s Bay do and to also vote for using tokens we gave them when they filled up. At the end of promotion, DOVE managed to earn $1,368 which we were very grateful for. Here are Sam and Katie holding the token of how much we earned from everyone voting for us. Thanks to Z Kennedy Road for selecting DOVE Hawke’s Bay to participate in this promotion, we are truly grateful.